I just scooped up one of these Mothers Premium Chenille Car Wash Mitt - Scratch and Lint Free for ONLY $4.29 (Retail $7.29)! The Mothers Premium Chenille Wash Mitt steps it up a notch from the competition. The extra plump microfiber caterpillars are high density which offers an easier, and better cleaning experience. This mitt really holds the soap suds - creating a non-abrasive wash as the mitt glides across the car. 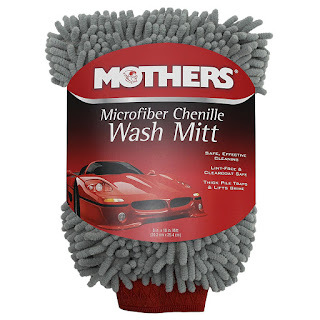 Once your finished washing your car, keep in mind that the Mothers Premium Chenille Mitt is machine washable with like items. Do not use fabric softener.